I have criticized people in the past for making too much of a single reading so I will only note that the monthly anomaly for April is the highest value since we have been keeping records. Is this proof of global warming? Of course not. I would list it as information consistent with the theory laid out by global warming. However we also have this interesting bit of information. The graph below is from the UAH data set looking at atmospheric temperatures. This is the preferred data set for skeptics since it is produced by two of the few scientists whom I would classify as skeptics (in the global warming sense of the word) and generally shows less cooling than other satellites analysis. The current year is the lime green line, if you can tell the color of it, just look for the highest line! Click on the link to go to the UAH site and you can create the graph yourself. We should be careful about reading too much into this since this is essentially the raw data and, like most data these days, it will probably need to be corrected / adjusted. Now, while surface temperatures are interesting, a number of people have been saying look at how the ice in the arctic is recovering this year, citing this as evidence of a cooling world. 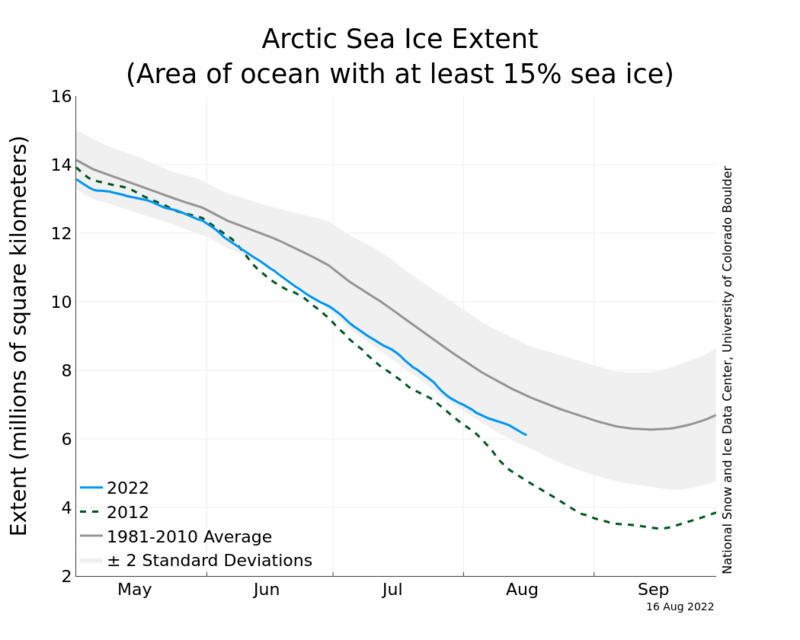 Indeed, while in the early part of 2010 the ice extent was almost "normal", if you look at it now (as of May 18) , you can see that it is currently 2 standard deviations below normal. This is probably what you would expect if the ice was thinner in the arctic which is what the scientists have been saying all along. Let me stress that all the above is observation and thus is not proof of global warming. However it is pretty good evidence that the world is not cooling after all. This is actually quite important since it should give zero creditability to the people who have confidently stated that the world is cooling or that global warming has ended (and yes, I have a list). On a personal note, work has been hectic for the first part of 2010. Hopefully regular blogging will commence soon. Since there has been little fodder for the skeptics, global warming has not been in the news much. However there has been a lot going and I hope to raise it in the weeks to come. This page contains a single entry by published on May 20, 2010 7:41 AM. Abousfian Abdelrazik: labour says no to Harper was the previous entry in this blog. Attentat in Ottawa is the next entry in this blog.